During a recent pass of Saturn’s moon Titan, one of more than 40 during Cassini’s planned four-year mission, the spacecraft acquired this infrared view of the bright Xanadu region and the moon’s south pole. Titan is 5,150 kilometers (3,200 miles) across. 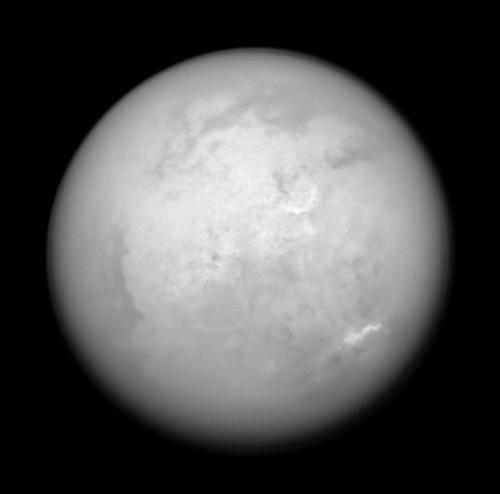 Southeast of Xanadu (and above the center in this view) is a peculiar semi-circular feature informally referred to by imaging scientists as “the Smile.” This surface feature is the brightest spot on Titan’s surface, not only to the imaging science subsystem cameras, but also to the visual and infrared mapping spectrometer instrument, which sees the surface at even longer wavelengths. The Smile is 560 kilometers (345 miles) wide. At the landing site of the successful Huygens probe mission, brighter regions correspond to icy upland areas, while the darker regions are lowlands that possess a higher proportion of the organic byproducts of Titan’s atmospheric photochemistry. Those results seem to confirm the long-standing hypothesis that Xanadu is a relatively high region of less contaminated ice. However, the cause of the even brighter Smile is a mystery that is still under study. Farther south, a field of bright clouds arcs around the pole, moving at a few meters per second. Around the limb (edge), Cassini peers through Titan’s smoggy, nitrogen-rich atmosphere. North in this image is toward the upper left. The image was taken with the Cassini spacecraft narrow-angle camera on June 4, 2005, at a distance of approximately 1.2 million kilometers (700,000 miles) from Titan using a spectral filter sensitive to wavelengths of infrared light centered at 938 nanometers. The image scale is 7 kilometers (4 miles) per pixel.